While we have seen leaked live images of the other Galaxy S10 models, there haven’t been many for the Galaxy S10e. That changes today. Several images have leaked online which show off the Galaxy S10e in all its glory. Samsung’s cheaper flagship model has now been completely revealed. There are some pretty evident security watermarks on the device in these images. Whoever this device belongs to will likely find themselves in a spot of bother with Samsung. This isn’t the sort of thing that Samsung would take lightly. Nevertheless, we now have our first good look at the cheapest Galaxy S10 model. As expected it has a flat 5.8-inch Infinity-O display. The front camera cutout is almost 0.5mm and not that different from the one on the Galaxy A8s. Consequently, the status bar looks chunky because the camera cutout is so big. This appearance may not be that appreciated by some users. We can also see in these images that the device will indeed be called the Galaxy S10e as mentioned in earlier reports. It has One UI which is unsurprising. This device will have the same processor as the other models but with just 6GB RAM and 128GB storage only. 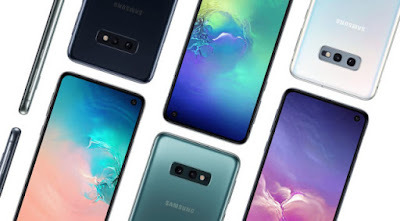 It will also have a dual camera system instead of the triple cameras on the Galaxy S10 and S10+. The PowerShare reverse wireless charging feature will not be present as well. We’ve exclusively confirmed that the Galaxy S10e will be the only model to be available in Canary Yellow. Other colors will include black, green and white. It’s expected to cost around $850. Samsung will unveil the Galaxy S10 lineup on February 20 in San Francisco with pre-orders slated to begin the following day. An additional leaked render clearly shows the placement of the side-mounted fingerprint sensor of the Galaxy S10e.